After host Jimmy Kimmelshowered guests at the 2017 Oscars with hundreds of parachutes filled with candy, he returned in the telecast's third hour with yet another food-related surprise: Cookies! There wasn't a celebrity in sight more excited than the Empire star herself, Taraji P. Henson, who lit up when Kimmel said, "Candy is great, but if you want something more substantial, I can provide that. Would you like cookies and donuts?!" And just like that, magic happened in the Dolby Theater as it began raining desserts! 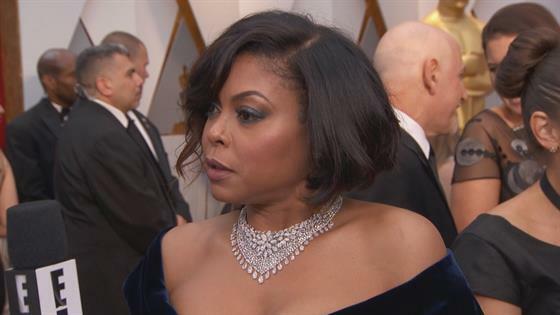 Taraji looked a little disappointed she didn't catch a parachute, but upon noticing Hidden Figures co-star Octavia Spencerdid, she reached over and asked, "Are you sharing?!" Taraji P. Henson's Mission to Do "Hidden Figures"
At the 2016 Golden Globes, Henson proved she is simply the best by handing out chocolate chip cookies to her fellow A-listers as she walked up to the stage to accept the Best Actress in a TV Drama award. "Cookies for everyone tonight," Taraji said when she got to the mic. "My treat." Never change, Ms. Cookie Lyon. Never change. For complete Oscars coverage, tune in to E! News at 7 p.m. and Fashion Police at 8 p.m. on Monday, Feb. 27.